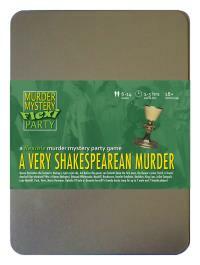 You've been invited to play the role of TITAN PARIS in A Very Shakespearean Murder. What scream through yonder window breaks? Queen Derivative the Second is having a right royal ado, but before the guests can forketh down the first oxen, the Queen’s jester Yorick is found dead-ed! Join us to find out who-duneth-it! As a lady-in-waiting, your job is to be pretty but not so pretty that you look better than the Queen. As such, your long pink dress is modest, with lacy bits and a full skirt. You always carry a quill and parchment. As lady-in-waiting to the Queen, you thought your life would be full of exciting adventure. But sitting all day in a royal court has been nothing but dull. To escape the monotony, you started writing - only to discover boredom has taken its toll on your imagination. My name is Titan Paris. I am a lady-in-waiting to the Queen. I have spent much time watching Yorick embarrass himself in court - his act was not so much comedy as tragedy and is the reason why I have sworn never to work with children or animals. Forsooth, I am a writer - my only weapon is a quill, and that is best used for tickling. All my work is my own. I would never plagiarize or derivatize. Alas, poor Yorick, I knew him too well. For my liking.